3D Modeling For Beginners aims to help you become the best 3D modeler you can be. 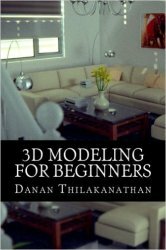 This book will help you get started with modeling in 3D and you will learn some important concepts about 3D modeling as well as some of the popular techniques which you can utilize to create any 3D model. You will learn about creating hard-surfaced objects like vases, tables and chairs. You will get a thorough overview of the steps needed to approach modeling detailed human characters. You will also learn about how to approach the creation of epic 3D environments. This book shares tips and tricks throughout, that will help you become a better 3D modeler and ways to speed up your workflow. Practicing is one of the best ways to become better at any skill. Towards the second half of the book, there are a number of exercises covering the creation of a variety of different 3D objects, of which you are highly encouraged to follow along, to get practice and ultimately gain confidence in being able to tackle any 3D project with ease. Although this book is designed for beginners, it is aimed to be a solid teaching resource since it will cover almost everything about 3D modeling. There are 12 chapters and over 200 pages of helpful advice, lessons and exercises that are solely aimed at making you a better 3D modeler. This book avoids any jargon and will explain concepts in an easy-to-understand manner.